Do you use and trust the productivity app Evernote? The recent Evernote update causes the author of this week's must-read article to worry. Evernote shifted its business model, and is perhaps transforming into a different product. Users are getting used to licenses and freemium models, but those models can change at the whim of the operators. We as founders should be careful not to alienate people from these models if we wish to continue using them. What would you have done if you ran Evernote? Also read about Clinton's new policy agenda, product-market fit, SF pride, scale-up vs startup, and how raising too much money can damage your startup. The recent Evernote update is a stark reminder that when using SaaS services you are essentially trusting a service with your data. You don't actually own the product, like say a paper notebook that allows you to do whatever you want to it. What would happen if for example Google decided to stop with gmail or Facebook did the same thing? Should we worry what this change represents? Free MDM for Enterprises. Manage and secure your org's mobile devices with Mobile Device Manager Plus. Most startups will have other things on their mind, but politics influences the success of the startup scene in several ways. In her new technology policy agenda Clinton describes how she wants to tackle tech's biggest issues. Recently graduated students will be happy that she plans to forgive student debt for starting entrepreneurs. Marc Andreessen describes his definition of the product market fit as follows: "The customers are buying the product just as fast as you can make it – or usage is growing just as fast as you can add more servers. Money from customers is piling up in your company checking account. You’re hiring sales and customer support staff as fast as you can." This article describes why! It's pride season and Silicon Valley is joining the San Fransisco pride parade with unicorns and rainbows. Startups fail all the time. These are the top 20 reasons why. Learn from the mistakes others made! We all have assumptions we didn't even know we had, and we have to realise that the opposite of them may also be true. This video describes that we cannot just assume that something that is the case for one person is also the case for another on the other side of the world. We can call that weird or just different. How do you deal with this in your startup? "They’re completely different animals, and they require different leadership, skills and focus." Whether you are inbound or outbound, you need a plan. With limited resources at their disposal, startups need to focus on effectiveness for their lead generation tactics. This article describes which lead generation tactics give you the best quality. Getting outside cash is expensive. Raising money from investors or banks wil come at a price. This startup decided to save money by looking at all expenses, costs and contracts and by doing so saved enough money to increase the profit margin to a healthy 51%. This article describes some of the reasons why raising too much can harm your startup. But there is no right answer to how much you should raise. Fundraising is an important process, not only to validate your idea and progress since your last round, but also to grow your business when revenue alone is not enough. Yeah! 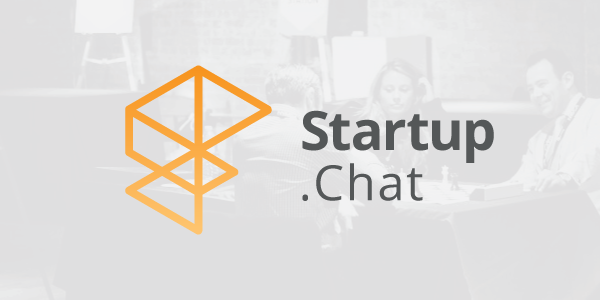 You have read our Curated till the very end, so here's your special FYI: We've negotiated and acquired the Startup.Chat domain. Obviously this will look great on stickers, but we're also going to re-do the entire page. If you have any feedback on the page, feel free to reply and help us make founders excited to join!